It's been a while since we first made mention of HootSuites upcoming application for BlackBerry. However, in that time the folks at HootSuite have been working hard at getting their application ready for the masses. The latest newsletter sent out to folks gives us an idea of where, exactly they are in the process. 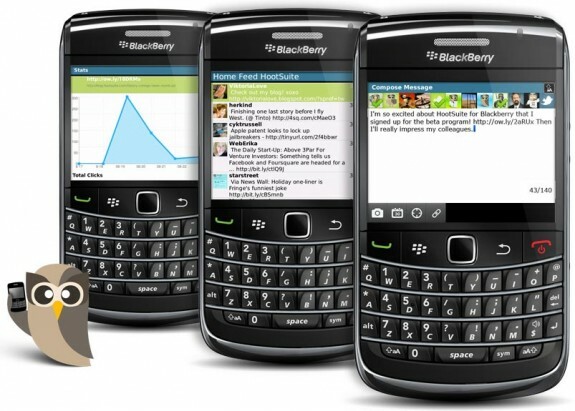 Blackberry fans are adamantly vocal about their desire to Hoot from their beloved ‘berrys — and the wait is almost over! Soon fans everywhere will have a ‘berry-ready Owl with Facebook and Twitter in your hand — just don’t squish it! To quench your desire, here are the first screenshots of HootSuite for Blackberry to share with your colleagues. The pilot batch of HootSuite for Blackberry beta users are testing the first iteration with more invites going out soon (we haven’t forgotten about the thousands of you who signed up to test already). Twitter applications have become plentiful on the BlackBerry platform and that trend doesn't seem to be slowing down any time soon. I'm excited to see what HootSuite will bring to the table that others may not. If you haven't already, be sure to sign up for the beta testing via the link below.